Sometimes all your kitty needs is a good scratch and stretch! It feels good, it helps them sharpen their claws and makes them feel at home! 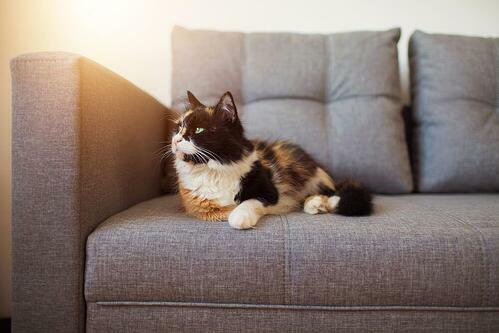 But what can you do if your friendly feline has taken an interest in your sofa? It’s not their fault - sometimes our sofas are just too appealing and they just want to dig their claws in! But that’s often not ideal from a human perspective! Luckily there are a few simple ways to prevent your cat from scratching where they shouldn't. Have you ever wished your cat could talk to you? Though we love having a cat chat your kitty can communicate in other ways. And if they frequently scratch the sofa, it might be a subtle signal from them that “something’s not quite right. "Scratching is a natural activity that cats use to calm themselves - they release invisible “territory messages” that comfort them when they scratch. So if your cat has suddenly started clawing the couch, or scratching a lot, consider if anything has changed that could be stressing them out. You can help decrease their stress by offering distractions. For example give them you can: lots of love and attention - easy! Choose a tall post. Cats like to stretch their bodies fully when scratching. Make sure thepost is tall enough, at least 30" tall. Think about location. Place the post by your cat’s bed - this encourages them to use it fortheir morning scratch. You can also place posts near already scratched areas. Cats tend toreturn to areas where they have already scratched. Use FELISCRATCH by FELIWAY. Using this on the scratching post encourages your cat touse the post - the visual (blue lines) and “territory messages” direct your cat to scratch whereit is applied. Smells are another way for your kitty to communicate. When they scratch, they’re creating “territory messages” which they find comforting. But, these messages also work as a scratching reminder. They can draw your cat back to the same area to scratch again.Cleaning all unwanted scratching areas with warm water and soap to remove the scent, will help to limit return scratching. Sometimes, even with a nice scratching post, our kitties are a creature of habit and it can take more to help them change here they scratch.Remember to keep calm and don’t shout; your cat is more likely to scratch if they feel uncomfortable. Equally, be sure to reward your kitties with affection when they do use their scratching post - encourage them to keep scratching there! 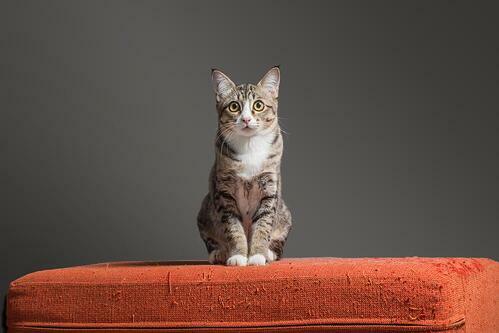 There’s no need to give up and sell the sofa if you follow these 4 simple tips to redirect your cat’s scratching. It’s important to always remain patient and using FELISCRATCH by FELIWAY from the start when you adopt a new cat or kitten to help encourage your cat to use the scratching post. However, if your cat has been scratching for a long time you should also consider using FELIWAY CLASSIC - spray it on scratched areas (after cleaning them with water and soap) to discourage your cat from scratching there. This sends “happy messages” which provides reassurance, but remember it should never be used on the scratching post as it would prevent your cat from using their post.